The lounge is positioned on the first floor affording panoramic sea views and leads onto a terrace, where the invigorating smell of the sea air and the sound of the crashing waves provide a haven for relaxation. A games room offers indoor entertainment and the enclosed garden to the rear gives direct access to the beach. Each bedroom is warm, cosy and tastefully decorated to a high standard and the property enjoys the convenience of three bathrooms. The property has four bedrooms, which will comfortably sleep eight people; two bedrooms have double beds and the remaining two each have two single beds. 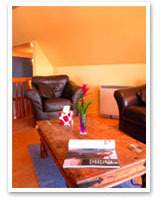 The kitchen is very well equipped and recently refurbished. Bed linen, towels and fuel are included. A travel cot and highchair are available. Pets are welcome. Bathroom with shower over bath, toilet and basin. 1 Double bedroom with en-suite bathroom with shower over bath, toilet and basin. Games room with pool table and table tennis leading to a large, enclosed garden with outdoor furniture. 1 Double bedroom with sea views. Lounge with dining area leading to a small terrace with sea views. T.V, video and DVD player provided.